In a final scene of Kanye West's voyeuristic "Famous" video, the camera expands into a panoramic birds-eye-view of all the celebrities, sleeping side by side in the same bed. After the video's premiere at The Forum in L.A., Kanye gave a short speech, mentioning that a huge inspiration for the video was a painting by an American artist named Vincent Desiderio. "It began with a random phone call: “Kanye West is trying to get in touch with Vincent Desiderio. It is extremely important that he return our call.” After a series of missed calls and frantic text messaging I came to learn that I was being invited to fly out to Los Angeles the next morning to meet the acclaimed artist, and that Kanye, “being a tremendous fan” of my work—I’m using quotes, because one hears that phrase so often in the art world that it might as well mean, “I have no idea who you are and please don’t call me out on this”—wanted me to be present at an event the Forum in L.A. No other information was given." 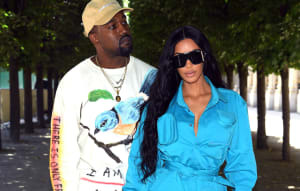 Desiderio says that he and Kanye were "on the same page," writing, "I felt as if I had been presented with the most extraordinary gift: Kanye and his crew had spent the past months producing a video of tremendous power and beauty, and at its core was a painting." Read Vincent Desiderio's full essay for W Magazine here.